rec. Casino Basel Musiksaal, Dec 2004, June 2005. DDD. Hybrid CD: SACD which can also be played on a standard CD player. Many years ago I bought a job lot of orchestral full scores, a carton load, at the bottom of which I found the printed full score of Weingartner�s fascinating Second Symphony. Furthermore it was Sir Henry Wood�s copy with his markings, and a timing at 50 minutes. In fact Wood seems to have only played it once, on 24 September 1901, when newly published. Now at last we have this vivid recording which plays for 43� 45�. In the first few years of the twentieth century, Weingartner made a brief impact on the musical scene as a significant new composer. In London in 1902-3 the St James�s Hall Popular Concerts � that celebrated and long lasting chamber music series, then in its penultimate full season � saw Weingartner as the pianist in his own Piano Sextet with the Kruse Quartet, and some songs. Later in the same series Londoners heard Weingartner�s String Quartet Op 24. At Bournemouth, Dan Godfrey played the First Symphony twice. It was also heard in London at the Philharmonic Society, but neither seems to have played the second or later symphonies. Weingartner�s spectacular choral settings Traumnacht and Sturmhymnus � surely candidates for recording - written for Henry Coward were sung by the Sheffield Choral Union in 1904, and then forgotten. In the UK at least, Weingartner�s reputation as a composer was soon eclipsed by his standing as a conductor, in which capacity he first came to England in his mid-thirties, in 1898. Yet he wrote nine operas, the first of which, Sakuntala, introduced to the Hofkapellmeister at Weimar by none other than Franz Liszt, was first produced there in 1883. There are many songs, some of which were recorded on 78s - two with Weingartner orchestral works from 78s are on Japanese Shinseido/EMI SER 8544 - though only Liebesfeier, with orchestra, is in today�s catalogue, in many historical recordings. Of course there is his celebrated - should I say infamous? - orchestration of the Hammerklavier Sonata (reissued on Pearl GEMMCD 9358; Naxos Historical 8.110913). 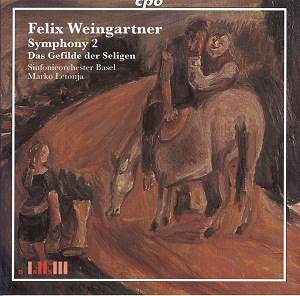 Older followers of European radio stations may remember a number of Weingartner revivals in the 1960s and 1970s, and in addition to the tone poem on this CD perhaps the most notable was the Cello Concerto in A minor Op 60 played by the cellist Werner Taube and the Saarland Radio Orchestra, not yet recorded commercially. In his recent authoritative study of conductors and the German tradition (The Virtuoso Conductors, Yale UP), Raymond Holden devotes a chapter to Weingartner, remarking �Weingartner�s compositions deserve to be heard�. One has, whole-heartedly, to agree. This splendid CPO series of Weingartner�s orchestral music, has pipped a projected series by a British company to the post, and has so far spanned three volumes giving us symphonies 1, 2 and 4, as well as orchestral tone poems and overtures. Here the coupling is the tone poem Das Gefilde de Seligen - the score gives the English translation as �The Fields of Heaven�, the booklet as �The Elysian Fields� - after a pastel by the painter Arnold B�cklin, whose pictures also inspired Reger and Rachmaninov at much the same time. It is a substantial and imposing score at nearly 23 minutes. The vast wide-spanning climaxes, all solemn chorales and shimmering brass, are remarkably well caught by the Basel players, conductor Marko Letonja feeling the spacious architecture and allowing the music time to grow and soar. Yet the highpoint of this CD, indeed of the series thus far, is the Second Symphony. Those who responded to the First Symphony on CPO 999 981-2, a cherishable even bucolic work, falling somewhere between Dvoř�k and Humperdinck in idiom, will find that Weingartner�s style, though still recognisable as the composer of that work, has moved on, and is now on an altogether more epic scale. His Brucknerian treatment of simple motifs, massively orchestrated, builds with inexorable repetition though always knowing when to move on. The near-quarter hour first movement sets the scale. This is a delightful movement which immediately attracts one to Weingartner�s musical world; a new voice in a familiar language.� From the slowly emerging drama of the Lento introduction, with its gradual dramatic build-up, and gorgeous second subject tune, the first movement is an arresting statement which needs to be heard live. The scherzo is in the l�ndler tradition of German symphonic scherzos. Here a massive bucolic country dance is eventually contrasted with a winning pastoral trio tune. In contrast the eloquent Adagio opens with an extended Beethovenian hymn from the strings. There is a soaring violin solo, sweetly taken by the leader who is uncredited on the booklet, and certainly deserves to be named. Later Weingartner asks the timps to play triads (two players), an effect that is spooky when quiet, gloriously threatening when loud. After three such gripping and strongly characterised movements the opening of the finale revisits the opening theme, but apart from the closing pages is never bombastic. Indeed the opening fugato, at first on the strings is beautifully caught, the placing of the strings remarkably specific. Recording producers have differing philosophies on the orchestral balance they favour in the studio, particularly in the way they deal with the harp. In the symphony Weingartner writes for the harp sparingly, and it does not appear at all in the slow movement. This suggests to me that when he asks for it he means it to be heard. I must say I often felt the harp to be too reticent, especially in the outer movements, and in its one undoubted moment of drama, ten seconds from the end, a glissando in octaves across two bars marked �con tutta in forza�, fff, while the orchestra is ff to me is all but inaudible, at least when listening in stereo. �This should be a great splash of romantic colour; rather disappointing. Otherwise here is a long overdue project and this a worthwhile disc.� The Second Symphony is a noble work, which will probably represent the series in many non specialist collections. I have only played the CD in stereo. The majority of listeners who like me are without SACD equipment can be assured that generally it still sounds remarkably good. I look forward to future instalments and especially Weingartner�s choral Seventh Symphony of 1935-37.